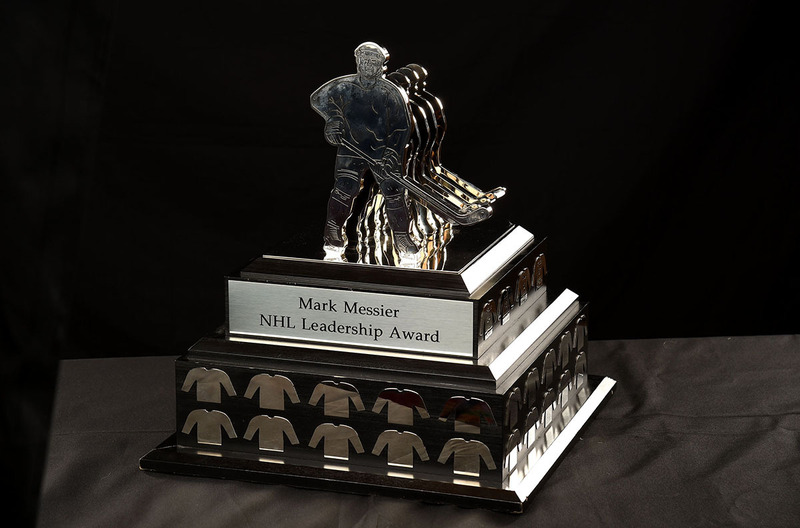 An annual award presented &ldquo;to the player who exemplifies great leadership qualitites to his team, on and off the ice during the regular season.&rdquo; Suggestions for nominees are solicited from fans, clubs and NHL personnel, but the selection of the three finalists and the ultimate winner is made by Mark Messier himself. History: This award was first handed out in 2007. Nashville Predators defenseman Shea Weber is the recipient of the Mark Messier NHL Leadership Award. Weber, Nashville&rsquo;s captain since 2010-11, reached the 20-goal and 50-point milestones for the third time to guide the Predators to their second straight playoff berth. He also is a leader with several charitable organizations both in Nashville and his hometown of Sicamous, British Columbia. Weber - along with teammate Pekka Rinne - started the 365 Pediatric Cancer Fund, which raises money and donates tickets to patients at the Monroe Carell Jr. Children&rsquo;s Hospital at Vanderbilt University. That initiative has contributed more than $700,000 since its inception in 2013-14. In his hometown of Sicamous, Weber partners with the Sicamous Shootout to host a golf tournament in support of the BC Cancer Society. Presented by Bridgestone in honor of one of hockey?s great leaders, this award was first handed out in 2007.